Weather Tight is a family-owned and -operated company offering remodeling service throughout nine counties in Southeastern Wisconsin. We’ve quickly become Wisconsin’s most recommended remodeler since opening our doors in 1986. Over the course of our 30+ years in business, we’ve served over 25,000 satisfied customers—and now it’s your turn. Whether you’re looking to re-side your home or have all new windows installed, our licensed, bonded, and insured professionals can help. All of our installations are performed with care, and our products are guaranteed against defects or your money back. We even take care of the warranty paperwork for you! Stop by our West Allis showroom today to browse some of our available products and to ask any questions you have. We look forward to meeting you and to getting started on your Mukwonago home remodeling project. Easy to work with. Always informed of status. I found everyone very nice and easy to work with. I was a bit disappointed that an hour before my patio door/bay window installation, I received a phone call that the patio door person had called in sick and was asked to reschedule. I had the day off of work and my house was torn apart to prepare for installation. After explaining that this was an inconvenience, they were able to figure something out and my patio door did get installed. Luke and his crew were the best. They were here on time and worked very hard. They were very professional and cleaned up all the debris. I am very happy with how great my house looks - inside and out. It has been a pleasure working with the entire Weather Tight team. I am impressed with all your people--Ryan, installers (Nick and Luke), your office people--and with your product. You have shown yourselves to be attentive to the details of customer service. You are good communicators. You come across as genuine. Since I have had Weather Tight windows in my son's room about 18 months ago, I have seen that the windows "perform" over the seasons. I am particularly impressed that the windows (the glass? concave?) seem to let more light in and "magnify" the view as I look out. I noticed it in my son's room and I am noticing it again in my kitchen. Is this some kind of optics thang? Or??? Instantly update and refresh your Mukwonago home with new siding. Not only can it modernize the look of your home, it can also increase its curb appeal and energy efficiency while keeping moisture out. Our vinyl siding options come in a variety of colors to make sure you find exactly what you’re looking for. We can even recommend and install shakes and scallops to beautifully accent your “new” home. We’d also be happy to install a new door for you as the finishing piece to your remodel project. 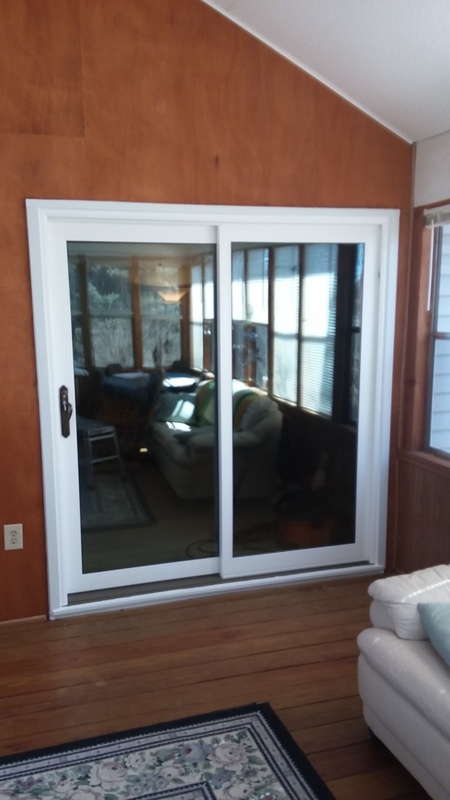 A new front entry door or sliding back patio door can add a beautiful touch to any home—not to mention increase its security. We can even install a fire door in your garage to help protect your family against a possible fire. Plus, all of our installations are weather tight so you can ensure they’re efficient. When it comes to re-roofing your Mukwonago home, there’s no company better than Weather Tight. We offer a vast array of roofing options including both metal and asphalt shingle. A reliable roof is one of the most important things you can maintain as a homeowner. Count on us for all of your roofing needs including installation. You can even watch some of Tod & Todd’s video tips where they discuss some advantages of metal roofing and roof replacement. We may also recommend new gutters and gutter protection to make sure your home is protected against water damage. Soffit and fascia are the final pieces to the roofing puzzle—every inch of your home will be covered and protected against outside weather. There’s no need to worry about customer service with us. And you can take advantage of available financing to approved credit. We want every home remodel to be as affordable and stress free as possible for you. Update your Mukwonago home with new energy-efficient windows. We are committed to offering only the highest quality windows available, so you can trust you’re receiving the best of the best. We offer a variety of windows including garden, sliding, full-frame, double hung, bow and bay, and casement—let’s design your home remodel together. And when you stop by our showroom, you can try some of the options in person to decide what you like and what you don’t like. We’ll measure your home and find a cost-effective option to meet your needs before expertly installing each window. We offer free in-home, no-obligation consultations and price quotes to ensure you receive the best customer service around without any pressure. We are here for you—let’s get started today. Mukwonago is a village rich in history—the name “Mukwonago” is derived from the Potawatomi word “mequanego” which means “bear’s den.” Residents take pride in living in the Lake Country area and in the fact that Eric Szmanda from CBS’s CSI: Crime Scene Investigation was born here! The famous actor attended Mukwonago High School and then went to the American Academy of Dramatic Arts in Pasadena, California. When you’re visiting the star’s hometown, check out other area attractions such as Pam’s Fine Wines and The Woodhouse Day Spa—which are both great for a girls’ day out! You can taste delicious wines and then enjoy a relaxing massage, manicure, facial, and more! If you’re looking for a bite to eat, Fork in the Road is definitely a great place to try or check out the Espresso Love Coffee coffee shop. You’re sure to have a great time in Mukwonago. When you are coming to our showroom from Mukwonago, start out driving south on WI-83 South/North Rochester Street for 1.2 miles and then merge onto I-43 North. Continue for 14.5 miles before taking Exit 59 toward WI-100/Layton Avenue. Turn left onto South 124th Street, right onto West Beloit Road, and then left again onto South 108th Street one mile down. Take another left onto South Wollmer Road and then a final left onto Milwaukee NN/West Oklahoma Avenue. You will see our location on the right.